Iranian U of M student Elnaz Afsharipour was prevented from entering U.S. due to travel ban. Photo by Chantal Zdan. 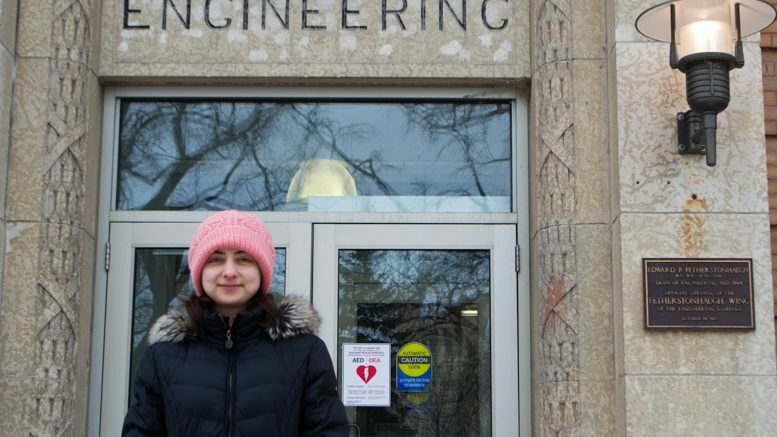 University of Manitoba research assistant and PhD candidate Elnaz Afsharipour was on her way to an engineering conference in San Francisco with her husband on Jan. 28 when she was denied access to the U.S. due to a recently-introduced travel ban. Afsharipour and her husband are Iranian but have been living in Winnipeg for four years on student visas. The two were prevented from boarding their U.S.-bound flight at the Winnipeg James Armstrong Richardson International Airport. A day earlier, U.S. president Donald Trump issued an executive order imposing a 90-day ban on entry to the United States for citizens from seven predominantly Muslim countries – Iran, Iraq, Libya, Somalia, Sudan, Syria, and Yemen. “If the current situation does not change, I am going to miss next year’s conference as well,” said Afsharipour shortly after. On Feb. 3 – shortly after the Manitoban spoke with Afsharipour – a judge from the Washington state district court suspended the travel ban nationwide. Afsharipour said the ban will not impede her academic progress from moving forward. The executive order issued by Trump on Jan. 27 suspended travel for residents of the seven affected countries for 90 days and suspended refugee admissions for 120 days. The order applied to permanent U.S. residents as well as foreign visitors. The ban’s implementation caused immediate chaos at U.S. airports and affected as many as 60,000 non-American travellers. The following day, a New York federal judge issued an emergency stay on the travel ban, releasing valid visa holders who were being detained in U.S. airports. On Jan. 30, 2017, Washington state filed a lawsuit in federal court requesting a nationwide restraining order blocking the travel ban. Four more states and a number of individuals followed suit. By Feb. 10, some 20 lawsuits were working their way through the U.S. court system. On Feb. 3, a Washington state district court suspended the ban nationwide and issued a temporary restraining order. On Feb. 9, an appeals court in Washington upheld the decision. The Trump administration has since signaled it will not challenge the decision to the Supreme Court but will issue an amended order, expected sometime this week. Only days after the executive order was signed, the U of M organized a pair of community events – one on the Fort Garry campus Jan. 31 and another on the Bannatyne campus Feb. 3 – to provide a safe space for students, faculty, and staff to open up and learn about available supports. The Fort Garry event seconded as the de facto memorial to discuss the mass shooting that occurred in a Quebec City mosque only two days earlier that left six men dead. Among the speakers at the Fort Garry event was Afsharipour’s husband and fellow PhD student Ramin Soltanzadeh. He said the travel restrictions have instilled a sense of anxiety about the future direction of the relationship between Middle Eastern nations and the new American administration and called on Canada to demonstrate to the global community its strength as a leader in multiculturalism. According to Todd Mondor, dean of the faculty of graduate studies, the university has implemented a dual effort in response to the ban. First, the U of M is helping current graduate students pay for certain travel costs that they incurred due to the travel ban and second, the university is extending the application deadline for any potential graduate students from the seven affected countries as well as waiving the application fee. Mondor indicated that more than 50 applicants have reached out for support since Feb. 2. Earlier in February, 50 current law students at the University of Manitoba teamed up with students from each of the other 22 Canadian law schools to help U.S refugees entering Canada. Since January, more than 130 asylum seekers have crossed the Canadian-U.S. border at Emerson, Manitoba, seeking refuge in Canada. According to the Safe Third Country Agreement between Canada and the U.S., which has been in effect since 2004, individuals are required to claim refugee status in the first country they arrive in. Human rights and immigration advocates have called for the agreement to be repealed and the students participating in the sit-in were researching avenues around the agreement under the premise the U.S. under the travel ban is no longer a safe country for refugees. “Robson Hall students have a more comprehensive understanding of how safe-third-country agreements create circumstances in which refugees become extremely vulnerable in light of changing on-the-ground country conditions,” said Pearlman.